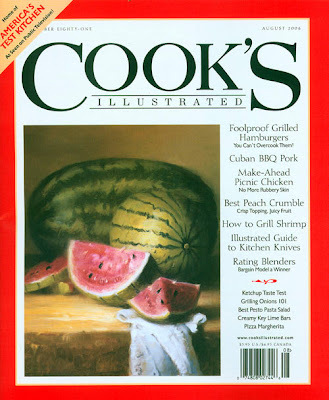 I love Cooks Illustrated. I find myself letting out an audible "Huh? Really?" when I read this magazine. Their test kitchen will make one dish up to 130 times, slightly modifying small details to figure out, "What makes a pork tenderloin too dry? What is the best way to make a glaze stick?" While I do miss beautifully styled food photographs, I love reaping the benefits of their tedious testing. An article from the May issue breaks down the perfect Pork Tenderloin. This is my third pork post in 1 week. I'm not sure what that means, but here's a basic summary of the article: dusting a tenderloin in cornstarch and sugar give it enough texture to keep the glaze from slipping off. Then searing it on a stove top, gives it nice color and crisp texture. It can't be baked on this skillet (which is what I always do), or the surface will be destroyed, and the poor guy is all dried out. It needs to be transferred to a roasting pan with rack and baked at low temperature. Finally, they determined that four coats of glaze need to be administered for best taste. I have my menu for tomorrow night! Maple-Glazed Pork Tenderloin originally featured in Cooks Illustrated 3/4 cup maple syrup 1/4 cup light or mild molasses 2 tablespoons bourbon or brandy 1/4 teason ground cinnamon pinch ground cloves pinch cayenne pepper 1/4 cup cornstarch 2 tablespoons sugar 1 tablespoon salt 2 tablespoons gound black pepper 2 pork tenderloins 2 tablespoons vegetable oil 1 tablespoon whole-grain mustard 1. Adjust oven rack to middle position and heat oven to 375 degrees. Stir 1/2 cup maple syrup, molasses, bourbon, cinnamon, cloves, and cayenne together in 2-cup liquid measure; set aside. Whisk cornstarch, sugar, salt, and black pepper in small bowl until combined. Transfer cornstarch mixture to rimmed baking sheet. Pat tenderloins dry with paper towels, then roll in cornstarch mixture until evenly coated on all sides. Thoroughly pat off excess cornstarch mixture. 2. Heat oil in 12-inch heavy-bottomed nonstick skillet over medium-high heat until just beginning to smoke. Reduce heat to medium and place both tenderloins in skillet, leaving at least 1 inch in between. Cook until well browned on all sides, 8 to 12 minutes. Transfer tenderloins to wire rack set in a rimmed baking sheet. 3. Pour off excess fat from skillet and return to medium heat. Add syrup mixture to skillet, scraping up browned bits with a wooden spoon, and cook until reduced to 1/2 cup, about 2 minutes. Transfer 2 tablespoons glaze to small bowl and set aside. Using remaining glaze, brush each tenderloin with approximately 1 tablespoon glaze. Roast until instant-read thermometer inserted in thickest part of tenderloins registers 130 degress, 12 to 20 minutes. Brush each tenderloin with another tablespoon glaze and continue to roast until instant-read themometer insterted in thickest part of tenderloins registers 135 to 140, 2 to 4 minutes longer. Remove tenderloins from oven and brush each with remaining glaze; let rest, uncovered, 10 minutes. 4. While tenderloins rest, stir remaining 1/4 cup maple syrup and mustard into reserved 2 tablespoons glaze. Brush each tenderloin with 1 tablespoon mustard glaze. Transfer meat to cutting board and slice into 3/4-inch-thick pieces. Serve, passing extra mustard glaze at table.